What does it mean to have Jupiter in Capricorn? Hard work and determination are the backbones of Capricorn’s value system. 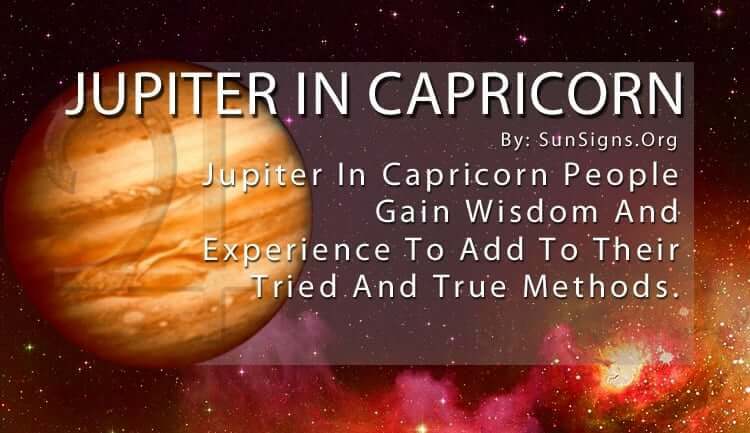 Jupiter in Capricorn is the most disciplined of all the zodiac signs. It’s through the moral and ethical code that they bring in good fortune, for their efforts rarely go unnoticed. They are rewarded for their honesty and integrity. Jupiter in Capricorn has a system, and it’s a system they have perfected over time. It’s what they use to assess their values and ideology, which is what Jupiter is all about. Jupiter also represents our travel likes and dislikes and how we bring in good luck and good fortune. In astrology, Capricorn uses their practical nature to attract all of these things. They gain wisdom and experience to add to their tried and true methods, and they stick with their carefully calculated decisions. Jupiter in Capricorn career can be good as they climb the corporate ladder in any job they do. And, their success brings in continued good fortune. They create their luck by sticking to their principles. Capricorn star sign knows who they are. And part of the drive of Jupiter in Capricorn comes from their incredible stamina. Just like their symbol is the mountain goat, they press on no matter how harsh the terrain or how rough the conditions. They can endure just about anything that gets thrown their way. The tenacity of the Capricorn Jupiter people is what keeps them wealthy and successful. They are cautious when it comes to any new opportunity. And, it often works out in their favor. They may miss out on bigger rewards by passing up the bigger risks, but they also rarely fail. The only thing the Jupiter in Capricorn has to be careful of is their thirst for more power. Status is critical to them, and they can get lost in the selfish nature of it if they aren’t conscientious of their actions. Their moral code is imperative to completing their work and living the kind of life they want to lead. Thus, this Capricorn sign has to watch out for anything that could corrupt their core values. It’s okay to be ambitious, as long as they don’t get too caught up in things like material possessions. Jupiter symbolizes progress, but uncontrolled greed leads to competition. While it may bring more success, it can also take them further away from their strong ethics. Balance is the key to maintaining a steady level of good fortune, and with their logical mind, they can achieve it. The strongest aspect of Jupiter in Capricorn’s personality is their capacity to plan for the future. Their skill set includes putting together a solid agenda for their day-to-day operation, as well as looking forward and setting new goals. They are resourceful enough to see and create a new objective, and then plot out the course to take to achieve it. This is how they stay at the top of their field. It’s this position that keeps the career opportunities rolling in for them. The only thing they could learn to do better is to share their wealth, whether it be financially or through their abundance of knowledge. Generosity is not something they think of automatically. They tend to be more frugal than others. But it is something that can help to keep them at the top of their game. Charitable efforts are often recognized by others, and it would be one more way to maintain their favorable status. How To Choose A Lucky Magic Symbol?